Pictured left to right: Lieutenant Governor Nancy Wyman, Sharon Agli-Pageau, Hunter Pageau, Senator Len Fasano, Representative Dave Yaccarino display a proclamation from Governor Dannel P. Malloy and a citation from North Haven lawmakers Sen. Looney, Sen. Fasano and Rep. Yaccarino recognizing the first annual event. 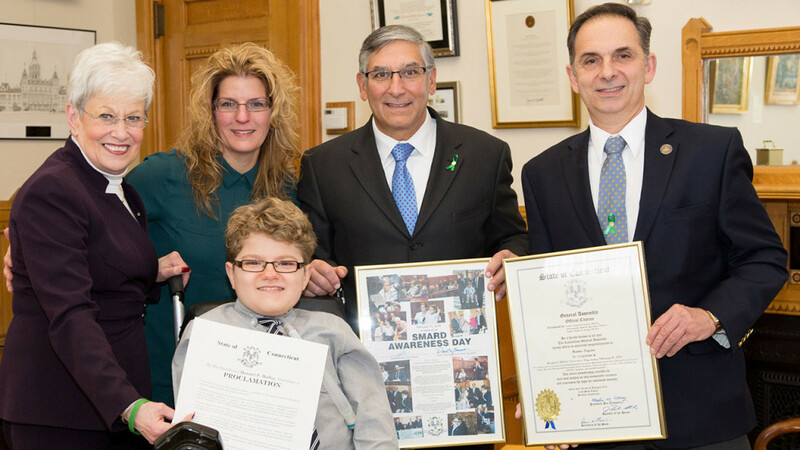 The first annual Connecticut SMARD Awareness Day took place on Wednesday February 10. The special day was created to raise awareness for spinal muscular atrophy with respiratory distress (SMARD), an extremely rare disease. Hunter Pageau, a 10-year-old from North Haven who has SMARD, worked with state lawmakers last year to pass legislation establishing SMARD Awareness Day. By raising awareness, lawmakers hope to support research and treatment for the rare disease.